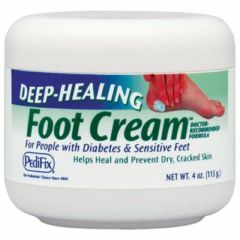 Deep Healing Foot Cream is a doctor-recommended cream features mineral oil, urea, lanolin and vitamins A, D and E to moisturize skin, soften calluses and revitalize your feet. Our special formula penetrates deeply to help heal dry, cracked areas-which is especially beneficial for people with diabetes and sensitive feet. Also works great on hands. Smells Good. Easy To Use. Healing. Soothing. I bought this product for my 8 yr.old grandson's rough, cracked heels. Other products proved ineffective, but within a week of using this cream at night and putting him to bed in socks after application - voila! His heels are now soft and smooth again. Easy To Use. Soothing. Healing. Easy To Use. Healing. Non-Greasy. Quickly Absorbed. Softens. Used daily in AM. Softens very dry skin on my feet. Effective product, but expensive. Alternate with less expensive cream. Soothing. Smells Good. Healing. Easy To Use. Work great for my feet, use daily.